The Neponset Valley Philharmonic Orchestra held its first ever Pops concert, â€œPops in Love,â€ on Sunday, February 13th at Foxborough High School. 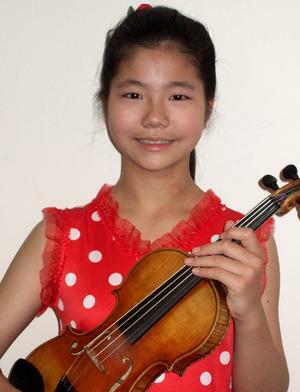 This concert featured 12-year-old violin sensation Mitsuru Yonezaki in the Sarasate â€œCarmen Fantasy,â€ as well as selections from Rossini, Leonard Bernstein, and local favorite Leroy Anderson. NOTE: Video clips from this concert are also available here. The NVPO’s February 13, 2011 Pops in Love concert brings together a bouquet of all-time musical favorites in keeping with the theme of the Valentine holiday. The program opens with Gioachino Rossini’s (1792- 1868)William Tell Overture, written for his opera of the same name that depicts the struggle of the Swiss nation for independenceÂ from their much larger Austrian neighbor. The opera blends action with romance, legendary feats of archery with humor and playful trickery, and emergent European nationalism with an eternal love story. Rossini’s overture capturesÂ these diverse themes in its many moods, including an amorous opening sequence with cello solo, a storm scene, a depiction of nature in the meadow as ornamented by theÂ woodwinds, and last but not least a rousing cavalry charge featuring the orchestra’s brass sections. Next we turn in our Pops program to the music from yet another famous opera, George Bizet’s Carmen. However, in this instance we will hear a piece written by the famous 19th Century violin virtuoso Pablo de Sarasate (1844- 1908)who has created a musical Fantasy based upon themes from Bizet’s renowned opera. This delightful but fiendishly difficult piece will be performed for us by the sensational twelve-year old violinist Mitsuru Yonezaki. The next three pieces in the program come to us from Leroy Anderson (1908 – 1975), a Cambridge, MA born composer famous for his short, playful and humorous compositions. These works regularly find their way into “pops” orchestraÂ concerts across the globe. Anderson was trained here in Boston at the New England Conservatory and at Harvard University where he subsequently worked as a conductorÂ and composer. Much of his music was debuted by the Boston Pops. The NVPO’s offering of Anderson’s music for this afternoon includes a good cross section of his work and musical style: Trumpeter’s Lullaby, The Pennywhistle Song and Fiddle-Faddle. Our concert also includes examples of the craft of Copland, Custer and Porter. Aaron Copland (1900- 1990)Â is perhaps the dean of American classical music composers of the 20th Century. Copland’s “Hoedown” is taken from his popular ballet Rodeo, a story of life, work, and romance set in the Southwest. By contrast Calvin Custer (1939 -1998) is known primarily for his arrangements of other composers’ works, in this case the Themes from 007, the music behind the ever-popular James Bond movies. Â AndÂ no love-oriented concert would be complete without a sample of the sensuous music of Cole Porter (1891- 1964),in this case his Begin the Beguine in an arrangement for orchestra by Carmen Dragon. To round out this Valentine’s Day special with the NVPO, our concert features two compilations of Broadway tunes: Stephen Flaherty’s (b. 1960) music to Ragtime and Leonard Bernstein’s (1918- 1990) music to West Side Story. Based on the book by E.L. Doctorow, the musical Ragtime explores the social, cultural, and ethnic tensions of life in America at the turn of the 20th Century. For his music, Flaherty draws on the emerging Ragtime jazz of thatÂ period. In the closing piece of this wonderful pops concert, Bernstein’s musical excerpts from West SideÂ Story accompanies the composer’s retelling of Shakespeare’s RomeoÂ and Juliet – this time set in 1950’sÂ New York City, and an appropriateÂ tale of love with which to end thisÂ NVPO’s Valentine’s Day treat!